Indonesia with its capital Jakarta is located in Asia (Southeastern Asia, archipelago between the Indian Ocean and the Pacific Ocean). It covers some 1,904,571 square kilometers (slightly less than three times the size of Texas) with 260,581,000 citizens. Indonesian, English, Dutch and Javanese are the languages commonly used by the people in Indonesia (consider regional differences). East Timor, Malaysia and Papua New Guinea are bordering countries. Indonesia straddles the Equator between the Indian Ocean and the Pacific Ocean. Indonesia is home to no less than 167 active volcanoes, far more than any other country. Some of the more accessible for visitors are in the Bromo-Tengger-Semeru National Park and the Ijen Crater in East Java, Mount Rinjani in Lombok and perhaps easiest of all, Mount Batur in Bali. The landscape is mostly coastal lowlands and larger islands have interior mountains. The average density of population is about 137 per km². The climate in Indonesia can be described as tropicalhot, humid, more moderate in highlands. Potential threats by nature are earthquakes, forest fires, Indonesia contains the most volcanoes of any country in the world - some 76 are historically active; significant volcanic activity occurs on Java, Sumatra, the Sunda Islands, Halmahera Island, Sulawesi Island, Sangihe Island, and in the Banda Sea; Merapi , occasional floods, severe droughts, tsunamis and volcanoes. To reach someone Indonesia dial +62 prior to a number. The local cellular networks are operated on 900 MHz, 1800 MHz, 3G, 4G. Websites typically end with the top level domain ".id". If you want to bring electric appliances (e.g. battery chaarger), keep in min the local 230 V - 50 Hz (plugs: C, F). The sign for the locally used currency Rupiah is IDR. 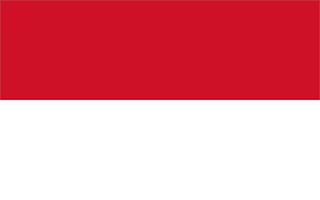 Two equal horizontal bands of red (top) and white; the colors derive from the banner of the Majapahit Empire of the 13th-15th centuries; red symbolizes courage, white represents purity.